This page took an unusually long time to color, but you can see why. I feel like I don’t mention what a good job Thrennody JG does with the colors on this comic enough. Panel 2 is so good! 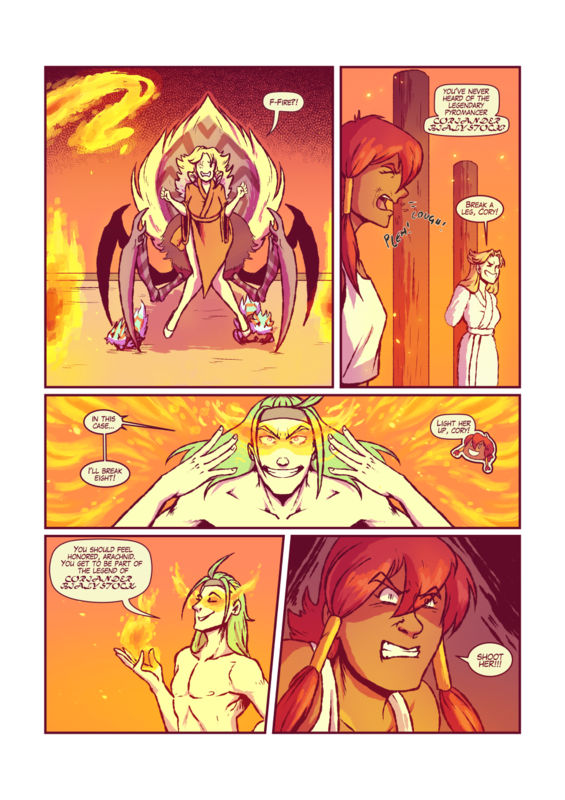 It’s not the flashiest panel on the page but it’s really good at getting the heat of the flame across. Really, she’s been killing it for this entire chapter (remember that sunset? ), and I think I might have more mood lighting effects in future chapters to lean into this. One of the cool parts of working with an artist (or two, in this case) is that you can start to learn where they shine and play into their strengths. Carlos was really good at backgrounds in Legend of the Hare, and I’m keeping that in mind as I write the new com-, uh, the new….competitive eel reviews I’ve been writing! Mm, competitive eels! Anyway, I’m really really hoping that we don’t have any more missed updates for a while, but obviously the buffer is blown through and life finds a way to mess things up. It’s part of the reason I’m working on my, um, competitive eels. To give you something to see even if one of the three people on this team has a life event. Don’t expect that in the near-term, though. Or do, and you can flame me in the comics for being lazy and not having a good work ethic or whatever you presume is going on. I hear you, and I’d be mad too. Not as mad as Saffron is. What’s her deal? Geez. Coriander: You've never heard of the legendary pyromancer, Coriander Bialystock? Liri: Break a leg, Cory! Saffron: Light her up, Cory! I get the impression that Cory has a tendency to sabotage himself with excessive showboating, and this makes me like him more. Especially if he ends up overcompensating with his magic and basically nukes the place. That would be awesome.